Don’t Be Afraid To Dream, Don’t Be Afraid of Life and Be Positive! „In my opinion integration in Slovakia is not the best… but I hope the situation will be better. It is a long process.“. This is how Martina Zemanová, a 26-year-old student at Comenius University and member of Civic Association TU SOM DOMA (This is my home), explains the situation of young disabled people in Bratislava. 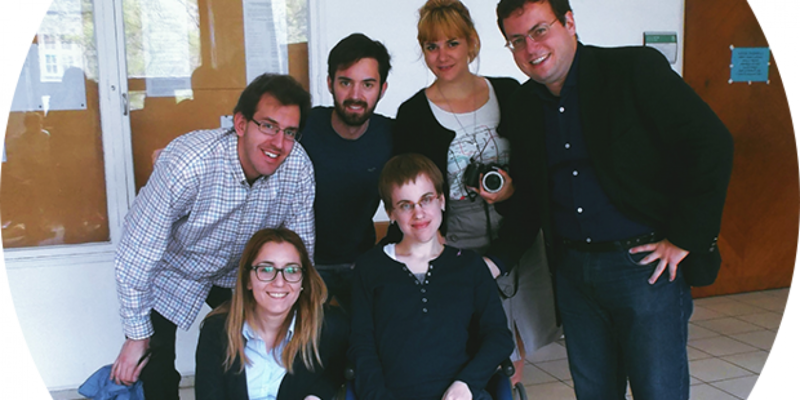 This association gathers six enthusiastic people whose goal is to help and support youngsters with disabilities towards independent life. They are living together in one apartment, organizing free time activities, cultural events, trainings for their fellows, professionals and volunteers but also providing services for disabled people. The main target of one of their projects, called I-mlyncek, is to raise awareness about their situation. They are doing this by motivating architecture students in creating a space for them to work without barriers. They are located in the first floor of the Architecture faculty of the University of Bratislava running a small Café corner where even you can go and ask for a cup of tea for example. Next to their café they have a surface suitable for anyone wanting to provide any idea for their future workplace. There they have even a little shop for selling handmade figures, making it a quite complete initiative. Can you tell us something more about your experience in this project? I think the project is very good for us and also for the students because, in my opinion, nowadays it is important to interact with disabled people and to help them with integration. So this is the most important aim of this project, I would say. What are the main things you would like to change to make your life better here in Bratislava? Maybe the opinion of people about us, about our ideas, dreams, because I think we are normal people with our own dreams and opinions, so this is the most important problem. If we change the idea of people about us we can change everything. I think the barriers on the ways, the architecture of some buildings, but I think everything is in the head of people. I think the main topic is very important and implementation is the last part of this. So do you think you should cooperate more with your organizations to motivate media to represent you more and give you more space. 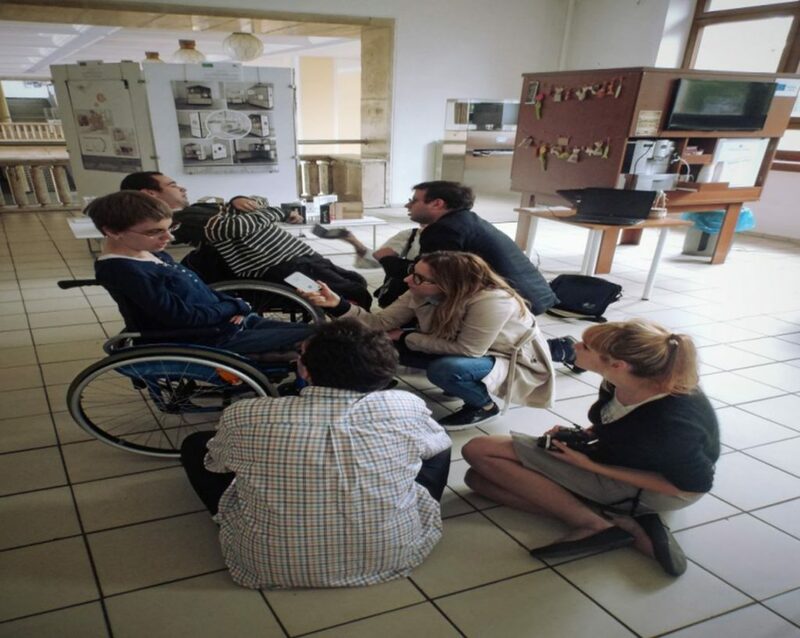 I am open to cooperation projects which are involved in this topic, for example I was volunteer in the Netherlands and I was the first volunteer in the history of this organization with a disability, so for me it was the biggest challenge in my life and I spent one month with guys from other countries. If you were the voice of your group, what would you say to young people around Slovakia and the world? Don’t be afraid to dream, don’t be afraid of life and be positive, always having a smile on your face. By the way, I have a question for you guys; do you have in Spain something like personal assistance for people with disabilities? I don’t know, for old disabled people we have, but I am not sure for young people. Because in Slovakia we have also the personal assistant, who is helping us for something like transport and if you need to read notes and also when I was in the Netherlands, I had a personal assistant, because without him it would have been very hard for me to move around. I think this is good things in Slovakia for me and for my life. For example Tomasz, he is my personal assistant for 5 years now, he is like my older brother. Finally, does the organization help to integrate disabled people in labour market? A little bit, I think, because in Slovakia integration is not the best. I traveled a lot in the past and if I compare the situation here for example with Spain or the Netherlands, in those countries integration is better. For instance, the metro and the platforms are at the same level, while the entrance to shops , so it is easier for people to have access. I hope the situation in Slovakia about that will be improved. But it is a long process. Martina is a young and enthusiastic woman, currently studying to be a social worker. In the future she would like to work with disabled people and/or to help women struggling with domestic violence and abuse. She defines herself as a big football fan, particularity from Real Madrid. Actually last year she fulfilled her dream of visiting Santiago Bernabeu stadium. *This article is a result of the Youth Exchange “Raise Your V.O.I.C.E. 0.2” which focused on raise the voice of marginalized groups across their societies, highlighting the true obstacles they face as the result of the “stigma” put to them by “legitimate society”, or the society living within the margins. The Youth Exchange was hosted by the team of Mladiinfo Slovensko from 13-20 April, 2016 in Bratislava, Slovakia. The information and views set out in this article are those of the authors and do not necessarily reflect the opinions and standpoints of Mladiinfo International.